* Launders easily, no shrinking, fading or ironing needed. 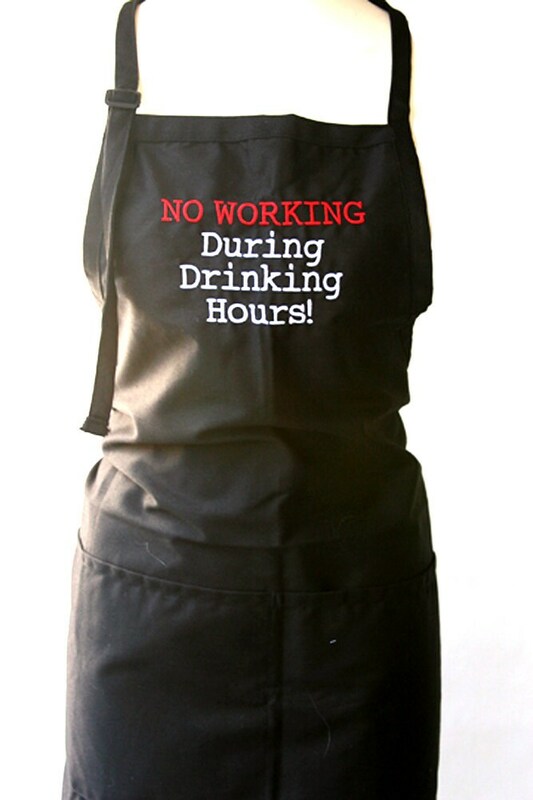 High quality cotton/poly blend apron embroidered with the perfect saying to make a statement at your next party. Fully adjustable to accommodate both larger and smaller builds. Most of our shipping is done with USPS. On Occasion we will use FedEx. Shipping to Military is no problem. We offer a "No Questions Asked" return policy on un-worn or unused garments. If you are not happy with our stuff or services, please let us know. If returning something, please include a copy of the packing slip or Order ID number and send it back to us. The return address is on the shipping label or you can contact us for it if it was misplaced. With CUSTOM orders, We regret we cannot accept returns. But contact us if you are not happy. we will try to fix whatever is wrong. We have no problems with custom orders. We started off this business by doing Bridal parties. Bride and Bridesmaid shirts and tanks and other fun stuff. We then started offering baby clothes, ladies clothes, aprons, dog clothes and just about anything that will fit into the machine. We also offer corporate logo wear for all types of companies and would love to provide you a quote for your company. We never keep or sell any information from any of our customers. The only time we use the address is for shipping. We never take the phone number down unless you ask us to call you about an order. Otherwise the only contact you may receive is for questions regarding your order through the "Conversation" process. We do not take credit cards through the website, this is all handled through third party, In this case it would be Etsy. We have NO access to the credit card numbers or any information that was supplied during the checkout process. We only get a notice when the card has cleared and the order should be shipped. Please call or message us with any questions you may have.